Kolkata Knight Riders stayed alive in the tournament with a show of desperation in the field, accuracy with the ball, and aggression with the bat. With rain lurking in the background, the Knight Riders won the crucial toss but had to deal with an aggressive start from Colin Ingram and JJ Smuts. However, led by Brett Lee and Jacques Kallis with the ball, they fielded superbly to allow only 67 runs in the last nine overs. Lee went for just 25 off his four overs, including nine runs off the 17th and 19th overs. The sub-par total of 155 was always going to take some defending on a skidding surface flanked by short boundaries and a damp outfield. And with the in-form Kallis and Gautam Gambhir, and Manvinder Bisla playing some scintillating shots, it seemed like the Warriors would need outside intervention. It arrived, in the form of rain, but by then nine overs had been bowled and the Knight Riders were 22 ahead of the par score. That not only brought the Kinght Riders, who are done with their league matches, two points, but also a boost in the net run-rate. 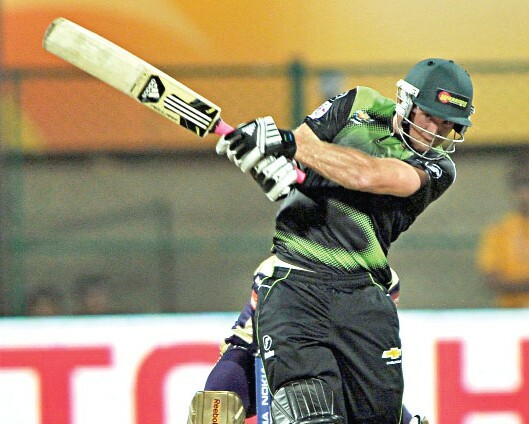 The game was won and lost in the last nine overs of the Warriors innings. Ingram, through some stylish aerial hitting, and JJ Smuts, through muscular blows, had put Warriors on course for a defendable total. Yet at that point, both efforts needed finishing touches, which never came by. Kolkata Knight Riders 83 for 1 in 9 overs (Gambhir 33*, Kallis 31*), Warriors 155 for 4 (Ingram 61, JJ Smuts 46, Boucher 38*). Kolkata win by 22 runs (D/L method).